Dr. Bassichis’ comprehensive approach to rejuvenation includes hand treatments to achieve complete, thoughtful and healthy outcomes for our patients. Because our hands receive so much exposure, they can be one of the first places to show evidence of aging. Some of the more common visible signs of aging include brown spots (a.k.a. “age spots or liver spots”), precancerous skin growths, uneven pigmentation, skin cancers, thinning skin, and prominent veins. 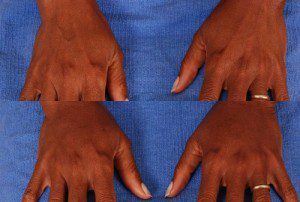 A variety of hand rejuvenation treatment options are available, so one treatment or a combination can be used to achieve a custom result. ADVANCED is pleased to offer a broad spectrum of medical and spa treatments to ensure that your facial rejuvenation seamlessly matches your hands. Options include prescription topical treatments, chemical peels, PhotoFacial with Intense Pulsed Light (IPL), Laser therapies, Fat Transfer, FDA Approved Facial fillers, Sculptra, and vein treatments. It would be our pleasure to care for all your Hand Rejuvenation needs. Please call us for a personal consultation with Dr. Bassichis.